I have spent a little time with the Microsoft Flow app and it works as advertised, but is limited. 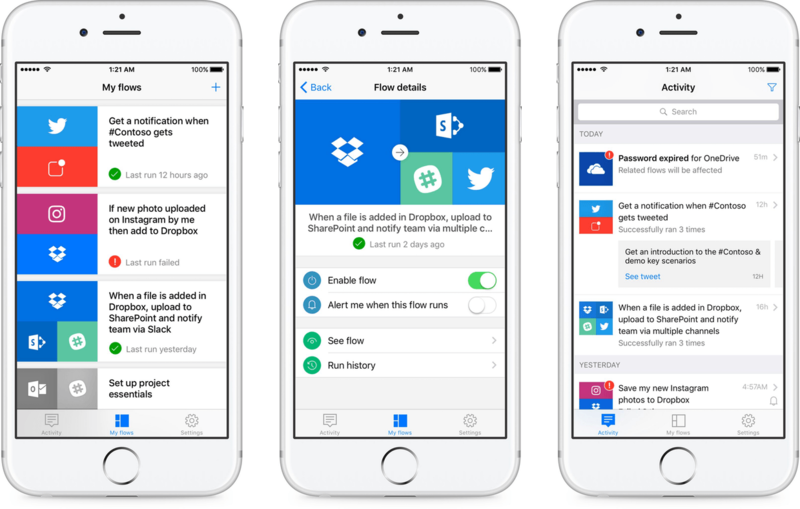 Unlike IFTTT's iOS app, Flow does not let you create workflows, though Microsoft says that feature is will be added in the coming months. In addition, the complex workflows that are possible in Zapier are not possible with Flow. For now, Flow is limited to doing things like turning workflows on and off, reviewing history reports of workflows that have run, receiving workflow push notifications, and evaluating error messages for workflows that fail. Flow has a long way to go before it approaches the power of Zapier or its app has the depth of IFTTT's, but it’s good to see Microsoft bring Flow to mobile devices and remains a service worth watching. Microsoft Flow is available on the App Store as a free download.